Kalmia Lat is a chief remedy for neuralgia and rheumatism. Kalmia Lat helps in neuralgia especially of right side. Pain starts after exposure to cold and extends over the head, ear, face and then goes down to the arm. Pain is attended with or succeeded by numbness of the parts. Pains are worse on right side, becoming cold, sunrise to sunset and better by eating. It also helps in cervical spondylitis. Kalmia Lat also helps in rheumatism and gout due to exposure to cold and accompanied with numbness, coldness and weakness in limbs. Pains are sticking, darting, pressing and shooting in downward direction. Pains of joints suddenly changes place and goes from one joint to another. Joints are hot, red, painful and swollen. Pains worse from least movement and better from continued motion. It also helps in rheumatic iritis and scleritis with pain more on moving the eye. Kalmia Lat also helps in gouty and rheumatic metastasis of heart. Pains along the ulnar nerve, lumbago, headache and vertigo. Vertigo when stooping or looking down. Kalmia Lat is recommended in cervical spondylitis, gout, headaches, lumbago, neuralgia, rheumatism, vertigo. 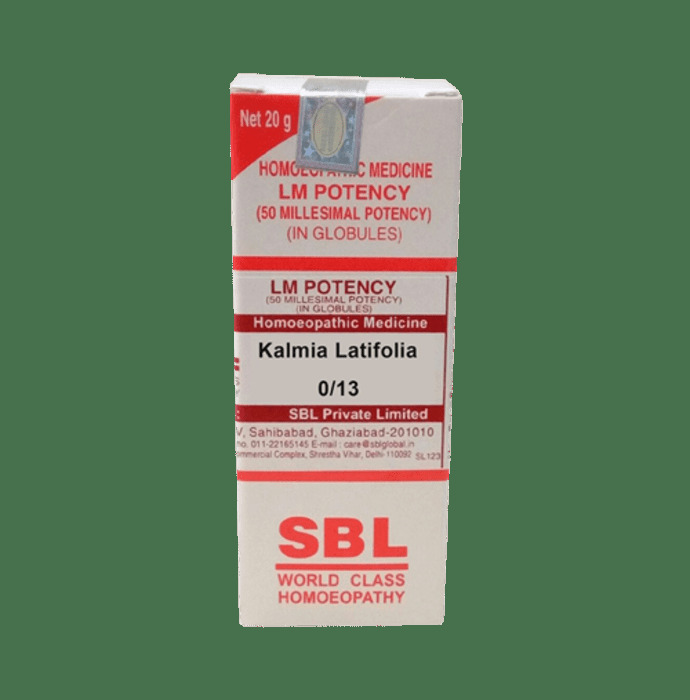 A licensed pharmacy from your nearest location will deliver SBL Kalmia Latifolia 0/13 LM. Once the pharmacy accepts your order, the details of the pharmacy will be shared with you. Acceptance of your order is based on the validity of your prescription and the availability of this medicine.